Magnetic Resonance Imaging, commonly referred to as MRI, is a scanning system that creates detailed images of the human anatomy using magnets, computers, and radio waves. 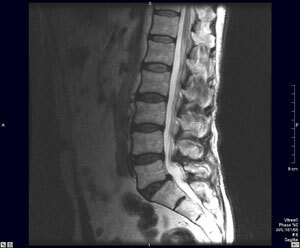 This type of Diagnostic Imaging allows the radiologist to produce images that are unique. MRI offers high quality detailed images of internal organs and internal structures of the body. For example, an MRI of a joint will provide detailed images of ligaments and cartilage, which are not visible using other study types. In some cases a contrast agent will be administered to enhance images for the purpose of interpretation. MRI is helpful in determining abnormalities of the brain and spinal cord, injuries or abnormalities of joints, tumors, cysts, or other abnormalities of various parts of the body, causes of pelvic pain in women, and many other conditions. Magnetic Resonance Imaging can not be used on patients with cardiac pacemakers, certain types of aneurysm clips, neurostimulators, inner ear implants, and some types of implanted medical pumps.